Speaking about the launch of the Sky 3D channel, John Cassy, Sky 3D's channel director, said: "Sky 3D will totally change the way entertainment is viewed in homes across the country. We see 3D as 'Event TV', an opportunity for people to share an incredible visual experience in their home. "The launch of the channel is the just the beginning, 3D has arrived and will change TV forever." When Sky first showed off its efforts at screening 3D TV back in December, TechRadar was there, feeling impressed but a little concerned that, with no firm commitments, it amounted to little more than a publicity stunt. 3D, after all, has been the 'next big thing' for decades, and although the latest round of polarised stereoscopic 3D is a world away from the anaglyphic coloured lens disappointments of the past, nobody would deny that it's going to take a massive push to convince the public that 3D is more than a gimmick. 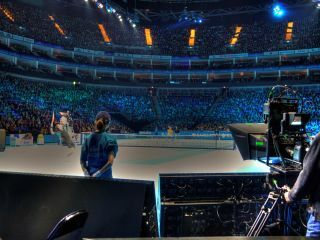 It is a decision that many would describe as brave, and some as foolhardy, but as we watched the company film the ATP Masters tennis at the O2 with modified 3D rigs, and then beam that footage live through one of its boxes, it's difficult to deny that Sky may just have a point; 3D could well be the next big step for television. The intent of everyone within Sky to make 3D TV a success is clear; special permission was required from the ATP just in order to allow a television in one of the executive boxes so that the service could be shown to journalists. An entire second outside broadcast (OB) van was present so that the action could be filmed and shown live. Within that OB van was not only the usual suspects – all bedecked in 3D glasses – but also three convergence experts, people just responsible for manually adjusting the field of vision, backed up by three specialist 'stereographers' that are in place to make sure that it's all working. Some of the lessons learned in the past 12 months are immediately obvious; in the original footage we were shown in 2008 the 3D suffered greatly from feeling like a load of 2D pictures on rails – like flattened sprites in a computer game. But, this has now been adjusted to allow for a much improved rounded feel; it adds a level of solidity that really helps make the 3D less tiring on the eyes because, we felt, your brain settles down and accepts this much quicker. When we interviewed Sky's 3D guru Brian Lenz in 2009 he suggested that filming live sport in 3D changed the game in a way that past improvements never really had. For instance, when HD first arrived on the scene for Sky, people suggested that it would fundamentally change the way that sport was filmed, but the truth is that – aside from the cameras – much of the expertise and knowledge that had been honed over years was still entirely relevant. With 3D that is not necessarily the case; new angles, new techniques and the abandoning of old tried-and-tested practice is necessary. Take something as simple as the DOG (digital on-screen graphic) – the graphic displaying the channel name that traditionally sits in the top right corner on all Sky Sports channels. In two dimensions it is largely unobtrusive, but we happened to witness one of the first tests of the DOG on the tennis and it's, frankly, a little odd because it sits well forward of everything else on the screen; it literally stands out in a way that it shouldn't.